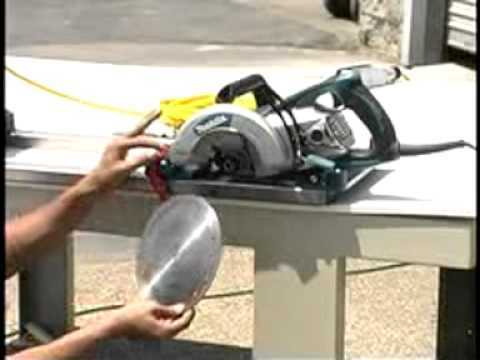 The Blue Ripper Jr.™ Rail Saw makes full plunge cuts up to 4 cm in depth. 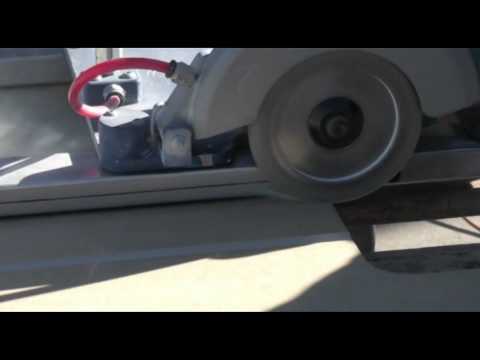 By using the rail system there is no need to use gauges, shims, or offset measurements. Your rail is your guide. 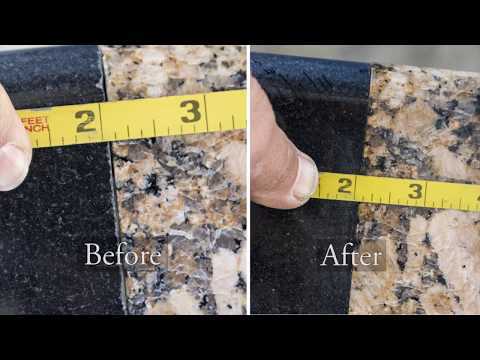 With this rail system you will have accuracy and smoothness absolutely better, and faster, than by hand. A tip we discovered to help prevent wear damage to the front hinge bracket of the Blue Ripper Jr is to coat the inside of the motor housing near the front hinge, as well as the hinge bracket where the blade sprays onto it, with silicone caulking or tooldip. As the silicone wears, simply re-coat the surfaces. A lot cheaper and easier than having to buy a new bracket and re-aligning the saw every few years! See the attached manual for operating instructions, replacement parts, and more! 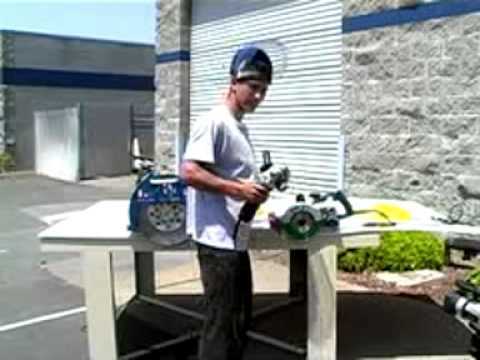 For a short period we offered the Blue Ripper Jr rail saw with the choice of either a Makita 5477NB, Milwaukee 6477-20, Skilsaw SHD77M, or a Bosch 1677M. This proved to be a bad choice - the majority of our customers that purchased the non-Makita brands wound up swapping them out for the Makita. This is because the bronze worm drive does not hold up to the vibration generated by cutting stone - we observed that the gear oil in these motors would go black within an hour's worth of cutting, and would often fail within a few days worth of operation. Makita is still the only brand that offers the infinitely superior hypoid bevel gear - which we have not yet seen be the point of first failure in even the most abused Makita. Because of this we've discontinued advertising and web sales of the models of the Blue Ripper Jr that used the other brands. Product may show minor usage (dust, etc.) due to factory testing before shipping. Blade shipped with product may not match images. We are constantly testing to find faster blades, and we ship each new machine with the best we have at the time of shipping. 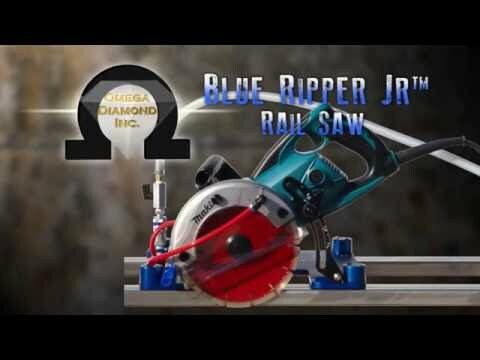 To order a saw with Blue Ripper Rails (basic edition combo pack) please call 1-888-996-4777 or 1-530-889-8977 and ask. WARNING! This product contains chemicals including lead, which is known to the state of California to cause cancer and birth diffects or other reproductive harm. For more information go to www.P65Warnings.ca.gov. Warranty - As of January 1, 2019 we have begun to enforce more forcefully our longstanding warranty policy on the Makita Saws. You will need to deal directly with Makita if the motor fails within the Makita one year warranty peirod. We developed our new Blue Ripper G2 Rail Saw as an upgrade to the Blue Ripper Jr.
Red Tubing for Water Injection on Blue Ripper Jr.
Takes full plunge* cuts up to 4cm deep! Up to 4 FPM cut speed, single pass* through 2cm absolute black! Note - Our Rails are made of 304 stainless steel not soft aluminum. Furthermore, they are one continuous piece!! Not some flimsy bolt together!! Sold separately. * It is highly recommended to take multiple passes through the stone, 1/4 inch at a time, to prolong the life of the motor.